Small spaces don't have to be difficult to furnish! Combine great storage solutions and right-sized furniture for your bedrooms that tend to be on the smaller side. These perfect small bedroom solutions collections are available in twin, full, and queen and all work well with rooms sized 9' by 9' or larger. A great choice for youth bedrooms, guest bedrooms, and small bedrooms, these collections borrow case pieces from youth collections but have a versatile and sophisticated style. This taller panel headboard featuring vertical stripes in the design helps to draw the eye up in small sized bedrooms. This provides a feeling that the room is larger than it is which is exactly what you want for smaller rooms. The thin nightstand provides excellent storage while taking up a small footprint, so it consumes less space in your room! Sleek style and excellent storage creates this modern bedroom collection. A great choice for any bedroom, soft curves can work for a masculine or feminine room. Unique hardware sets this set apart from other classic dark brown bedroom collections. Park City's seven drawer dresser with arched mirror is sleek, understated, and a great size. Measuring only 58 inches wide this dresser packs the best amount of storage into a small footprint! With such a sophisticated hue, this version of the Park City bedroom is the same in structure and style but creates a totally different look. 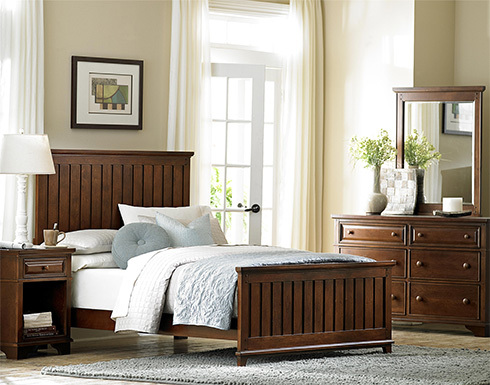 The sleek and modern style of this bedroom collection brings a bright and airy feel to any bedroom. This color is great for a smaller room to help open up the space. 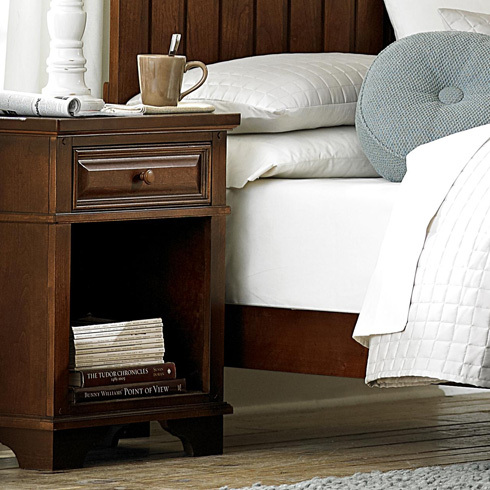 This collection's nightstand features a unique design with soft curves, an open shelf, and curved feet. The open shelf is perfect for stacking books or magazines while the drawer is great for hiding those pesky reading glasses or remote controls out of sight. To view these beautiful bedrooms in person visit our Basics Showroom - Building #3 in our Dulles, Virginia Furniture Store. Belfort Furniture boasts hundreds of room settings on display for you to view and be inspired by. Take advantage of our free design services if you're looking for some advice and guidance through your furniture selection.